As the financial crisis continues to deepen, many people are deeply concerned that collapsing credit availability will lead to powerful monetary deflation, much like it did during the US Great Depression of the 1930s. As compelling as these arguments seem to be – are they backed up by the actual historical evidence? 5) Briefly discuss the third logical fallacy that threatens many investors’ standards of living over the years to come, particularly those who are retired or investing for retirement. I received a letter from “GW”, an economically astute and well read person who had attended one of my inflation solutions workshops. GW said that I had made the most compelling case for inflation he had ever heard, but that he remained troubled. There were a lot of deflationists out there, and there were some highly intelligent and credentialed people who were making some powerful theoretical arguments for deflation. GW asked: would I be willing to debate some of those arguments with him? Name an example of a modern, major nation where thedomestic purchasing power (as measured by CPI) of its purelysymbolic & independent currency uncontrollably grew in value at a rapid rate over a sustained period, despite the best effortsof the nation to stop this rapid deflation? Please carefully note the underlined words in the central question above. They are essential. Consumer price deflation has a long and sometimes infamous history, as we will discuss below. However, a specific argument being made by many observers is that the United States (and other major modern economic powers) run the risk of falling into a powerful deflationary trap as the availability of credit collapses, the volume and velocity of money shrink, and this combination will then lead to major and rapid monetary and price deflation that the government will be powerless to stop. On paper – some powerful theoretical arguments appear to exist to support this assertion. What is the specific example of a modern, major economic power proving powerless to stop the rapid rise in the domestic purchasing power of its own independent currency, as measured by the CPI? And if such a deflationary example cannot be produced and defended – but we do have a very long and repeated history of inflationacross nearly all modern nations with modern currencies – is this not the single most important data point that individuals should consider in weighing the relative risks of monetary deflation versus inflation? The United States Gross Domestic Product was $103 billion in 1929. By 1933 it had fallen to $56 billion, a decline of 46%. Accompanying the freefall in both the economy and the markets, price levels were falling as well – meaning that the value of a dollar was rising rapidly. The Consumer Price Index was at a level of 17.3 in September of 1929, and by March of 1933 had fallen to a level of 12.6. This means that what cost $1.00 in 1929, cost 73 cents (on average) by 1933. This 27% deflation, this fall in the average cost of goods and services, represents a 37% increase in the purchasing power of a dollar. For some people, the effect of this deflation was to increase both their wealth and their standard of living. These are the people who had substantial money savings, either in physical cash, or fixed denomination financial assets that survived the economic turmoil, such as accounts in banks that did not go bust, or the bonds of companies that did not default. For these individuals, all else being equal, their standards of living rose because they had the same amount of dollars, and each dollar bought more than it had previously. However, this increase in the value of a dollar was achieved at great cost for most of the nation (and the world). The reason for the increase in value was that dollars had become scarcer for businesses and most individuals. The destruction of the banks and much of the financial markets had dried up access to money on attractive terms. Widespread unemployment meant fewer dollars available to buy goods and services, which drove down the prices, which is what dropped the Consumer Price Index. Most importantly, the deflation was not independent of the plunge in the markets and economy, and not just a result, but most economists agree that this monetary deflation was actually a reason why the Great Depression got as bad as it did. Because there was not enough money, the source of funding for growing businesses was gone. Because there was not enough money, and the money outstanding had grown too dear, consumers were not spending. Because there wasn’t enough spending, businesses had to lay people off. Which further reduced consumer spending. The nation was caught in a vicious deflationary cycle, which it seemingly could not break out of. Yet, the United States did break out of the deflationary cycle, as illustrated in the graph above. After rapidly plunging for about 30 months, with the CPI seemingly in free fall and not able to find a floor – there was an abrupt turnaround. Not only was a floor found, but an immediate cycle of inflation replaced the seemingly unstoppable deflation. The nation turned essentially “on a dime”, from unstoppable deflation to inflation instead. A cycle of inflation that has continued until this day. President Franklin D. Roosevelt was inaugurated on March 4, 1933. He came into office with a mandate and agenda to stop the Depression, and that meant breaking the back of the deflationary spiral. His actions were swift, beginning with a mandatory four day bank holiday imposed the day after his inauguration. Five days after Roosevelt took office, on March 9th, the Emergency Banking Relief Act was passed by Congress. This was the first in a series of executive orders and bills that would take place over the following weeks and year, and would cumulatively take the United States government off the gold standard – and would also effectively confiscate all investment gold from US citizens at a 41% mandatory discount. From 1900 to 1933, the US government had been on a gold standard, and had issued gold certificates. In a matter of days in March of 1933, there would be a radical change, a veritable 180 degree turn, that would not only repeal the gold standard, but effectively make the use of gold as money illegal in the United States. There is a common simplification that people make when they look at money over time. They think that a dollar is a dollar, even if the purchasing power has changed a bit. This is a quite understandable mistake, particularly if your profession does not involve the study of money. So when we say history “proves” something about a currency, we need to be very, very careful that we are talking apples and apples, rather than apples and oranges. 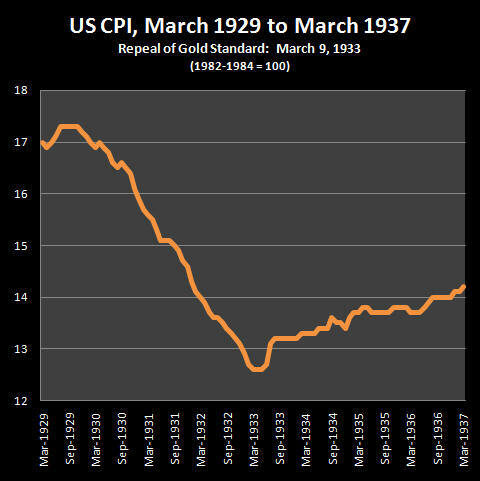 For instance, when we look at precious metals backed currencies, the deflation of 1929 to 1933 when the US was on the gold standard was nothing new. It was just the latest development in the ongoing cycle of inflation and deflation that characterizes this type of currency. Indeed, there were four major deflations during the century before Roosevelt ended the domestic gold standard, and the deflations of 1839-1843 and 1869-1896 were each much larger than the deflation of 1929-1933, with the dollar deflating roughly 40% in each of those earlier major deflations. This deflationary history does not, however, reflect the value of the “dollar” (as we currently know it) bouncing up and down, but rather the value of the tangible assets securing the dollar bouncing up and down around a long term average. Going off the gold standard was nothing new either. Many nations have gone through periods, particularly during wars, when more money is needed than there is gold or silver to back it up. So, they issued symbolic (fiat) currencies that were backed only by the authority of the government, or debased the metals content of the coins. These fiat currencies almost always turned out badly. Instead of cycling up and down in value over time, they tended to go straight down and never come back up. While global monetary history is complex and long, it is highly, highly unusual for a symbolic currency to experience major and sustained deflation at the levels that are the norm with precious metals backed currencies. It is this quite understandable but wrong belief that a “dollar” is a “dollar” that creates the ironic situation of many millions of people believing that the deflation of the US Great Depression proves the case for deflationary dangers in the current crisis. Not at all – what we have instead is the elemental logical fallacy of mixing up apples and oranges. Yes, the US experienced powerful monetary and price deflation during the early years of the Great Depression, but that was with a dollar that was backed by gold. A currency in other words, that has almost nothing to do with today’s dollar, other than the name. A currency type whose long term history is radically different than fiat currencies – such as the dollar today. Let’s revisit the sequence of events and what actually happened. The United States was stuck in a powerful deflationary spiral with a gold-backed currency, that seemed unstoppable. A currency that had little to do with what we call the dollar today, other than sharing the name. So, the government changed the rules, and replaced the old dollar with a new dollar, whose value was not based on gold. A dollar much like we have today (albeit not quite the same as there was still a gold backing on an international basis). And what happened? In the depths of depression, at the height of a deflationary spiral, the government successfully broke the back of deflation within one week. In the midst of deflationary pressures far greater than we are seeing today, the government not only stopped the deflation, but replaced it with inflation. Indeed, by May of 1933, only two months after the currency rules changed, the monthly rate of inflation hit an annualized rate of 10%, and even hit a 40%+ plus (annualized) monthly rate by June of 1933. If you’re concerned about a new US depression leading to unstoppable price or monetary deflation because of what happened in the 1930s, let me suggest that you study and remember the graph above. When you get worried about monetary deflation – take another look at March of 1933. Remember as well the one near universal lesson from the long and convoluted history of money: every time the rules governing a currency lead to a problem that causes too much pain for a government to bear – the government just changes the rules. The bigger the problem – the bigger the rules change (and the bigger the wealth redistribution, as discussed in the full version of this article). So, when we look not at near irrelevant gold certificates, but the dollar we have today, what the Great Depression of the 20th century in the United States historically proves is not the unstoppable power of deflation, but the opposite: that a sufficiently determinedgovernment can smash deflation at will, virtually instantly, even in the midst of depression, and replace it with inflation. In the process of breaking the back of deflation - the nature of the dollar itself fundamentally changed. Throughout the 19th century and the first 30 years of the 20th century, the value of the dollar went both up and down, as the (usually) gold-backed currency experienced regular cycles of both inflation and deflation. This cycle was replaced entirely by a new pattern – which could be characterized as down, down, down, as illustrated in the graph below. A 76 year old man or woman born in the 19th or 18th centuries would have seen the value of their currency go both up and down over their lifetimes, and there is a pretty good chance that at age 76, the dollar (or pound) would be worth the same or more than it was when they were born. When the US Government fundamentally changed the nature of money in 1933, it created an entirely different pattern – all down, and no up, so that for a 76 year old person today, a dollar will only buy what 6 cents did at the time they born. So as we try to decide whether the danger ahead is inflation or deflation today, what is the monetary lesson for us from the US Great Depression? The common belief is to say the Great Depression proves the awesome power of deflation, that the government can have a great deal of difficulty in fighting it, and may not be able to fight it at all. This is an extraordinary misunderstanding, and constitutes the second of our logical and historical fallacies. What the Great Depression showed was that if you have a tangible asset backed currency, such as gold or silver, and you enter a depression, then history has shown time and again that you're likely to have a period of substantial deflation. 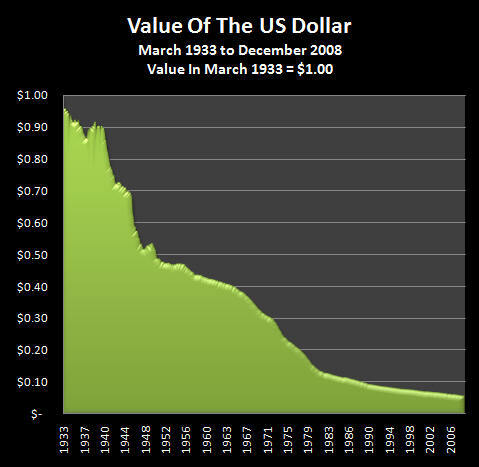 However what March of 1933 shows us, is that even in the midst of a terrific burst of asset deflation, even in the midst of a terrible depression, if you take away the tangible assets that back your currency and you introduce a purely symbolic currency, than the force of inflation that is associated with a purely symbolic currency (as well as the changes in monetary policy that are thereby enabled) can be so powerful that it overcomes the depressionary economic pressures and forces inflation. Indeed what March of 1933 shows is that the value of money can turn on a dime when we are using a symbolic currency. We have absolute proof that even in the middle of a depression, the government has the power to stop a deflationary spiral at will. We further know this deflation fighting strategy was not a one time anomaly, but was so successful that it broke the ongoing inflation / deflation historical cycle, and led to a 94% destruction of the value of the dollar over the next 76 years. It is a great irony that this lesson is so widely misunderstood. Unfortunately, this misunderstanding is highly dangerous for investors, as it leads them to worry about what is likely not a problem, instead of concentrating on the grave dangers illustrated by this same historical example. Dangers that involve the simultaneous combination of asset deflation (the destruction of the purchasing power of your assets) andmonetary or price inflation (the destruction of the purchasing power of your money). As I have written about in other articles and books, these are a potent wealth destroying combination with a long and very real history of destroying wealth in general – and retiree wealth in particular – in societies that are in economic distress. Bernanke got his nickname of “Helicopter Ben” from a flippant comment he made, in which he dismissed deflationary fears with a joke about dropping money from a helicopter if needed. This is a very important joke, with drastic implications for your personal net worth. Instead of fearing deflation, Bernanke finds fears about deflation to be humorous because he understands the principles described in this article very, very well indeed, and has for many years. There are no immutable and awesome powers of deflation that render governments helpless. Because once it is freed of its connections to precious metals or other currencies – money is really just a symbol with an inherent value of zero. What gives a national currency value are the rules that are set up by the government. And if the rules become inconvenient, well, what’s the point in being in power, if you can’t change the rules when you need to? Changing the rules is not a theory about what Bernanke might do. It is a description of what he has already been doing on a massive scale. The self-imposed shackles that used to restrain past Fed chairmen are already history. The Fed is creating money at a rate never seen before, trillions of dollars a month, effectively out of thin air. The Fed typically doesn’t do this, because, of course, such actions rapidly destroy the value of the currency. But if the person in charge of the money supply understands that destroying the value of the currency is how you prevent deflationary spirals from getting started – and believes massive and fast government intervention is the best way to stop an incipient depression before it gets any worse – then much of what the Fed has been doing becomes more understandable. 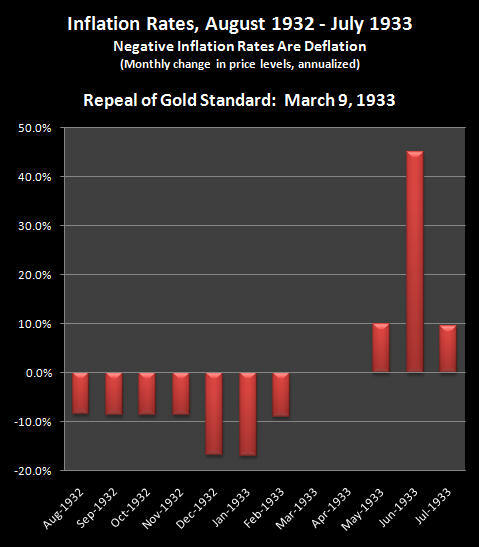 Our first fallacy was the widespread belief that the Deflation of 1929 to 1933 proves that major deflation is a major risk for a nation in depression – when what it actually proves is that deflationary spirals are a major risk for gold-backed currencies, even while providing concrete historical evidence that symbolic currencies which are backed by nothing but government policies (like the dollar today) can be forced into inflation even in the very middle of a severe depression. There is a third fallacy which is perhaps the most important, and that is the belief that inflation or deflation changes wealth for the nation as a whole and there's nothing that you personally can do much about it. This belief that we are all in the some boat together is perhaps the most dangerous mistake of all for individuals seeking to protect their wealth. Inflation and deflation do have an impact on the real wealth of society, they do affect the creation of real goods and services, and impact the real GDP, but they also do something else that is every bit as powerful, that is even more immediate and that is deeply personal. What inflation and deflation do is that they redistribute the rights to wealth within our society. When we look back to the Great Depression in the years 1929 to 1933 then, for retirees at that time who did not have their savings in the market or in banks that went bust, those were actually good years for them financially, particularly relative to the rest of the population. Monetary deflation redistributes wealth from society at large to many retirees. If actual history is what matters to you rather than theoretical discussions, unfortunately, we have a long history of what happens with nations in severe economic distress, when they have a symbolic, independent currency (not explicitly tied to another currency). That history isn’t one of those fiat currencies soaring in purchasing power, despite the best efforts of the economically wounded nation to keep that from happening. No, the very well established pattern is that the currency collapses in value (price inflation), even as the purchasing power of assets is collapsing (asset deflation), much like what is happening with Iceland today. That collapse in the value of the currency necessarily forces a major redistribution of wealth, and the segment of the population that is most devastated by this seems to always be the same. It’s the retirees, and the people close to retirement. When we look to Germany, when we look to Argentina, when we look to Russia – it is the pensioners who are impoverished more than any other group. Unfortunately, history is repeating itself again. When we look at the headlines about the destruction of retiree investment values, pension assets and so forth, we're really just seeing the beginning. Because the crisis "solution" that is being chosen, which is creating dollars without the ability to pay for those dollars, essentially represents the annihilation of most of the retirement dreams of the baby boom generation, even if that is not yet recognized. There is not an even cost that is being born by society as a whole, rather some segments are bearing much more of the burden than others. If your peer group (particularly Boomers and older) is headed for disproportionate financial devastation, then happenstance is unlikely to offer a personal way out. Instead, you must instead take quite deliberate actions to change your personal financial position so that wealth is redistributed to you, rather than away from you. This essay and the websites, including the mini-course, DVDs and books, contain the ideas and opinions of the author. They are conceptual explorations of general economic principles, and how people may – or may not – interact in the future. As with any discussion of the future, there cannot be any absolute certainty. What this website does not contain is specific investment, legal or any other form of professional advice. If specific advice is needed, it should be sought from an appropriate professional. Any liability, responsibility or warranty for the results of the application of principles contained in the website, DVDs, books and other materials, either directly or indirectly, are expressly disclaimed by the author.